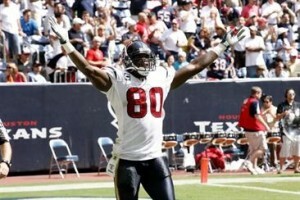 Andre Johnson is the Best WR in the NFL. He has great size speed and athleticism with incredible hands. He has the ability to brake away and considering his team, Johnson should be a great fantasy target this season! Look to pick him up early, but realize most people could sleep on this hibernating talent! The best post-season of all time? Maybe. Larry Fitzgerald is a monster talent who in the past has left me wanting more. He can and will be a huge game receiver but sometimes he doesn’t show when it comes yards production. However he is by far the best Leaping WR in the NFL so this guy gets a lot of jump balls and therefore TDs. It’s a fact that Fitzy brings down TD’s like it’s his job, which it is of course. 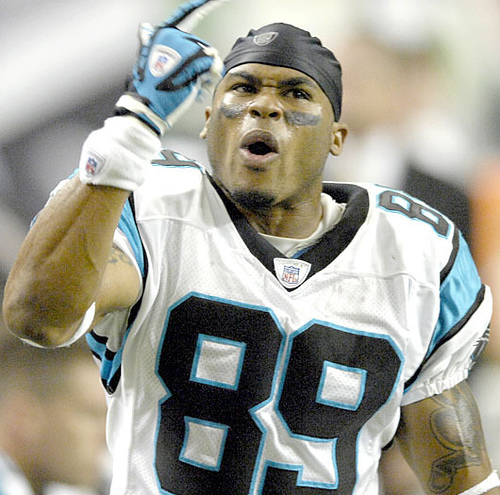 This ex-Pittsburgh University Panther is a safe pick this NFL season but there is a downside. He is on the Madden cover this year and may fall to injury, so all fantasy players beware! Warner is a great QB, however if Warner goes down all bets are off, as well because Lienart stinks and we all know it! What can I say about Randy? Moss you killed some of us last year in fantasy with your up and down season. Yet, Tom Brady is back, so your still the man! This guy is always a top WR but with Brady back he’ll be consistent, so recognized people, you are looking at a legend in the making! This kid is the real thing. Calvin has only played for 2 seasons and already is a top tier talent. Calvin produced over 1300 yards last season and posted 12 TDs. This season Calvin will be going into his brake out 3rd season, and with numbers like the ones he had last year, I would not be surprised to see him rack up over 1400 yards this year with 15 TD’s! Calvin was vaulted to the number 1 Spot when Roy Williams departed and Calvin just seems to be getting better and better, regardless of who his QB is. Calvin is ready and willing to post great Fantasy numbers for you week in and out. With Harrison gone Reggie Wayne should without a doubt steal the spotlight. When you have Peyton Manning throwing you the ball and your across the field from Anthony Gonzalez who is only 6′0 tall, you know your going to get a lot of Red Zone passes! Reggie is a monster player and could be the best Fantasy WR every year. He is in the right place at the right time with the right QB. You could try to double on a little Manning and Wayne this year for extra points! Smith is the only small WR I would draft for my fantasy squad. This guy just puts up numbers, year in and out. He is a small guy so don’t expect a lot of Red Zone touches but with calves like the ones he has it is still possible that he can jump over tall defenders in the end zone. Last year he had over 1,400 yards, yet he only posted 6 TD’s. He has all the tools but just needs to find the end zone. Bryant is ready to be the true #1 WR. With Galloway gone, don’t be surprised to see this big fella start up where he left off, posting over 1200 yards last season. Antonio is now the number 1 and should put up great numbers regardless of who his QB is. Due to some new rumors It seems that the Bucs may be interested in Plaxico Burress. So remeber, if The Bucs pick up Plaxico you should stay away, but if they don’t Antonio is your guy. Bryant is a top talent who has already had his fall from grace in the NFL. He has worked hard and now is on a strong comeback. This guy is a sleeper but needs to be respected this season as a top WR talent. I know at years end he will have the stats to prove it. The big question is, “Who will throw him the ball?” Greise or Freeman? Only time will tell. This guy just seems to have what it takes. 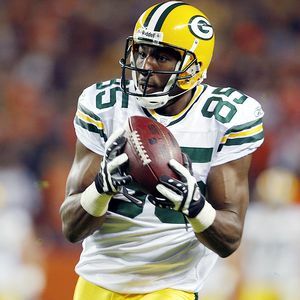 Greg Jennings produced over 1200 yards last season, but seems to struggle in jump ball situations. He has great potential but with only 1 full year of starting under his belt I still see him as a big strike, do or die type wide out. He may not put up numbers every week, but when he does god it will feel good. Do not hunt for this guy early due to his 5′11 size issues. He has great YAC, just realize he isn’t a high jumping 6′3 red zone target! T.O. In buffalo. I want to know, “How long until he eats Trent Edwards for lunch?” I know he is getting the ball but don’t forget he is in the twilight of his career. At 36 we just don’t know if Terrell has what it takes, to be a star with a team like Buffalo. Terrell could get upset early, regardless it will be interesting to see how T.O. feels about the jokes of BEAST MODE!!! Terrell Owens will be a top Fantasy WR until the day he retires to me, due to his work ethic and will to win. Terrell can be your greatest reward this season or your biggest bust, so this pick like always is up to you! Everyone always dogs Roddy. He is a Top talent WR, and he has the stats to prove it. Over the past season he has shown that he can be consistent producer, silencing all his critics. Get this jumpy WR if you can because he is the one of the WR’s in the NFL off the line serving up double moves like they were hot cakes. I’ll be looking for Roddimus Prime this season on the draft boards, without a doubt. Should be the quickest rookie WR to make a Impact this year, due to childress adding in 16 plays working Harvin into the offense before pre-season has even started. Childress plans on getting Percy the ball by any means necessary out of the Wildcat as instituting WR quick screens and flare patterns type plays for Harvin to thrive while using his ridiculous quickness. Jeremy Maclin is a the 2nd best WR in the draft and guess what folks he gets to play with Donovan and the revamped Eagles line. Expect big things from Jeremy this season. Just don’t expect it from jump street. Yet by week 8 everyone will know who this kid is, and Fantasy planning around him! Crabtree has had a complicated surgery this off-season and is hoping to be the huge impact player we expect him to be. Crabtree has been compared to Jerry Rice, which puts a lot of pressure on him to succeed. My biggest issue with Crabtree is this, “Who is going to throw him the ball?” The 49ers pass blocking is not that great and they might have a QB controversy brewing. My advice is to pick this kid up however, because he could be the next “Great One”. I mean really just look at this kids college stats! He put up 41 TDs in only 2 seasons, Thats is just ridiculous! Tagged: Best Rookie WR for 2009 draft, Best WR in NFL 2009, Best WR pick ups for 2009, Michael crabtree is great, Top 10 WR in NFL, Top Fantasy WR for 2009, Top Ten WR for Fantasy football 2009, Top WR for 09 NFL Season, Top WR's for 2009, Which WR to draft for 2009, Who are the best WR in the NFL?